This work has been presented at INDONESIAN PETROLEUM ASSOCIATION, Thirty-Sixth Annual Convention & Exhibition, May 2012. The authors of this article explained paleotectonic evaluation of the WMO area, and suggests another potential play other than Kujung Formation. Seismic interpretation with some attributes and also ant-track method are applied to strengthen the exploration concept. Another play that is quite interesting should be added to exploration in this area. Syn-rift play can be found in the western and eastern flank of JS-1 with Ngimbang Formation as the objective, whilst the post Kujung play can be emphasized on the flower structure pattern as an indication of wrench faulting. This wrench fault is responsible for tearing apart the Rancak and O.K. Formations during intra Miocene. 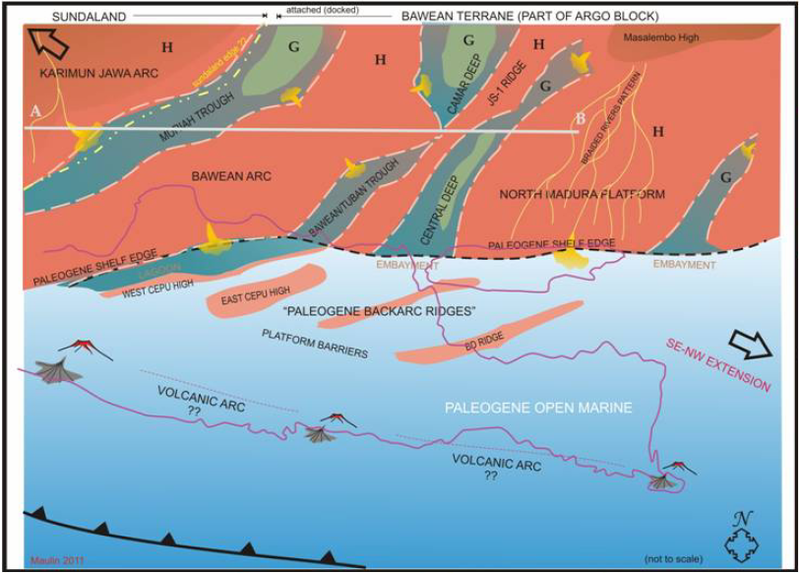 Tagged backarc basin, cipi armandita, exploration, hade maulin, horst, Java, Kujung Formation, ma'ruf mukti, Northeast Java Basin, reactivation, reservoir, seismic interpretation, structure, tectonics, tectonics of indonesia, trap.